We are sorry to hear that Bicycology has reached the end of the road. We have enjoyed working with, and been inspired by, this activist cycle project on many occasions. 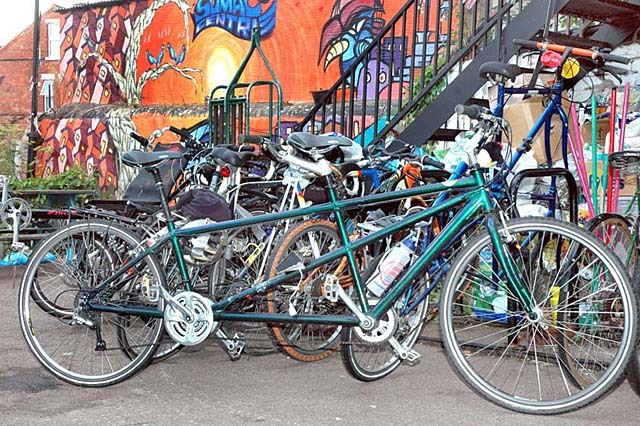 Bicycology is a collective formed by riders who wanted to build on their shared experience of the 2005 G8 Bike Ride and organise future events of a similar nature. By focusing on cycling we aim to persue our vision of a just and sustainable world through a combination of education, entertainment and creative direct action. The collective was formed during a weekend meeting at the Sumac Centre, here in Nottingham, in November 2005 with 15 original members. 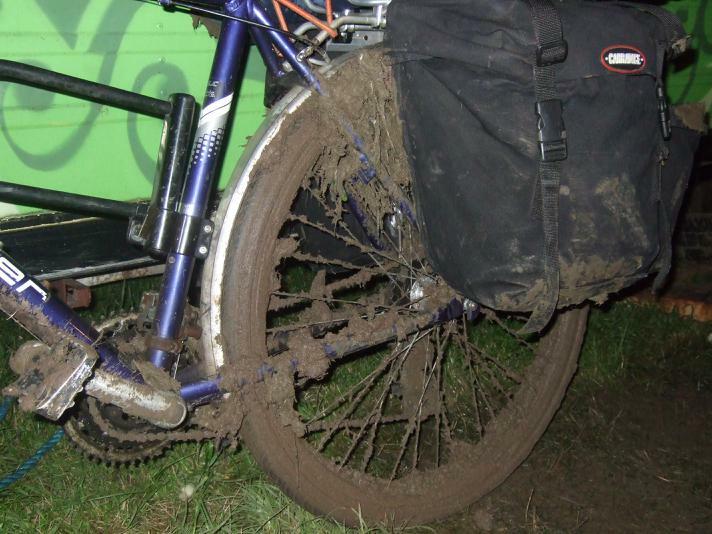 At the Big Green Gathering in 2017 Bicycology offered the usual selection of information and energy trailer amusements, and a multitude of bike jewellery and Tetra Pak wallets. 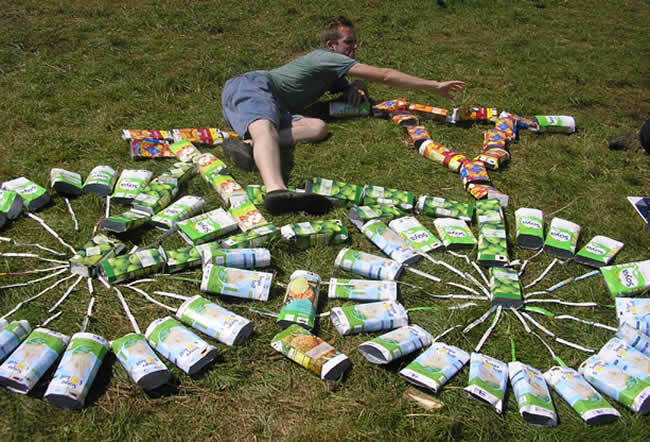 The wallets and their Tetra Tool Kits are featured on Veggies Tetra Pak Craft Recycling website. 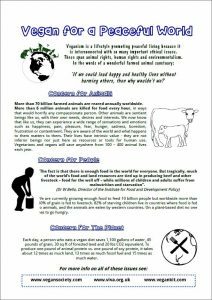 … the United Nations has reported that “livestock is a major threat to environment” all food is vegan, mostly organic and locally sourced to minimise food miles, provided by communal neighbourhood kitchens, many associated with the Social Centres Network. Sad to see that Bicycology has come to the end of the road. Veggies are always chuffed to be nominated for awards by VegfestUK. 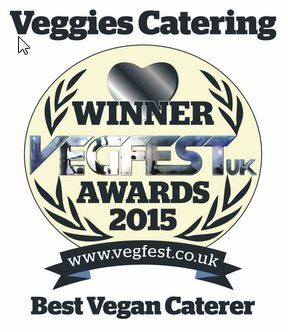 Having won the Best Vegan Caterer award many times, here & elsewhere, we now happy to step back and congratulate another excellent vegan caterer, Mex It Up, on taking the limelight. Of all the 300+ groups now mapped on our Directory of Vegan Caterers, Mex It Up are right up there at the top of the list for campaigning vegan caterers ‘For The Animals’. We are happy to work alongside them at many events, including Nottingham Green Festival and Sneinton Vegan Market. Well done Mex It Up and all the other Vegan caterers feeding the hungry without exploiting animals. Find them all linked from our Facebook post. 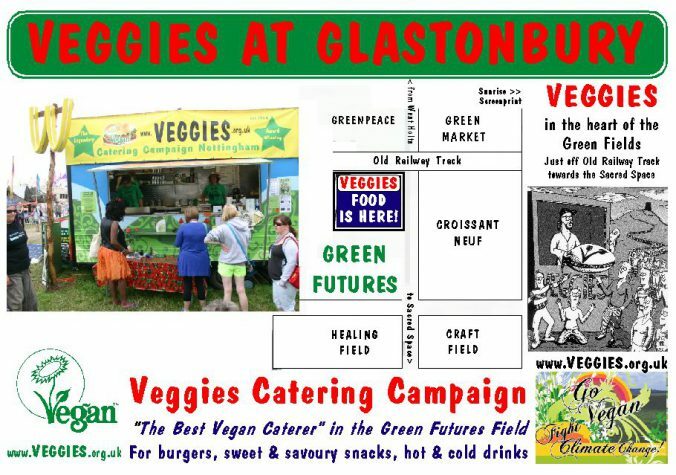 Lush UK (Nottingham) invited us to do vegan campaign outreach with them as an opportunity to launch our Veggies Catering Campaign Food for a Future plans for #GlastoVegan. However Glastonbury preparations and other factors mean that this will now happen after our return! 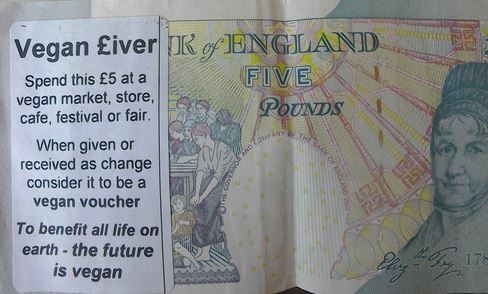 Lush are enthusiastic about Vegan Free Food Giveaway activities both in-store & on the streets, together with vegan information & recipes etc right alongside the till. Proceeds from #CharityPot sales & will go to support our campaigns, as they have done every since our Lush Plan for Glastonbury in 2010. 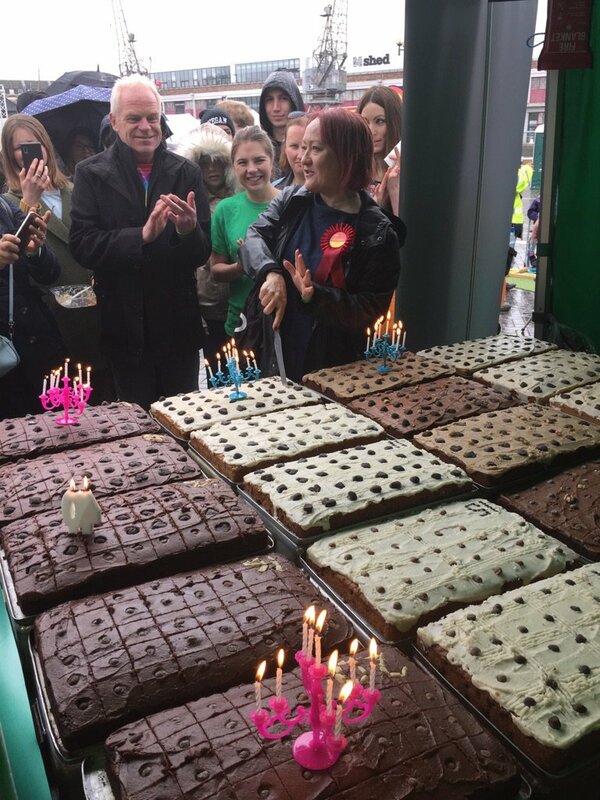 We have Nakd goodies to revisit the amazing 40 cake /1600 sample cake giveaway from Bristol Vegfest, in addition to sampling of Veggies burgers, pre-glasto, to test preferences between regular (aka ‘classic’) and new ethically improved Event Burgers (40%hemp 60%veggies mixes). If you would like to support our campaign team please contact us. 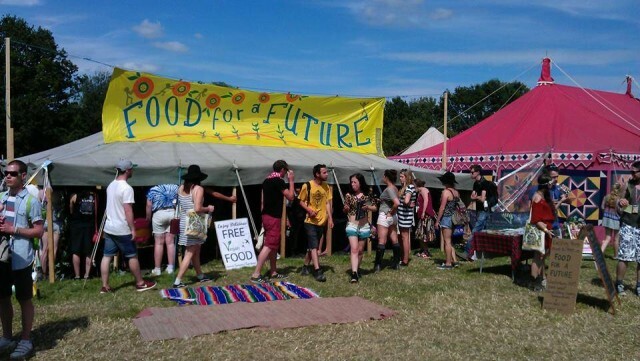 If you miss us in Nottingham, find at Veggies at Glastonbury Festival and follow Food for a Future on Facebook. We are interested in forming stronger links with the Vegan Society and a new Campaigners Network that they are launching. It would be a dedicated sub-group – a focused group of vegan outreach campaigners, perhaps modeled on Food For a Future &/or Leicester Vegan Campaigns. This could achieve better organised link-ups with people like Lush, Sneinton Vegan Market, School Visits etc, than Veggies is able to do alongside the 70 events that Veggies already attempts to do. Please contact us if you are interested in helping with Vegan Outreach activities in & around Nottingham. 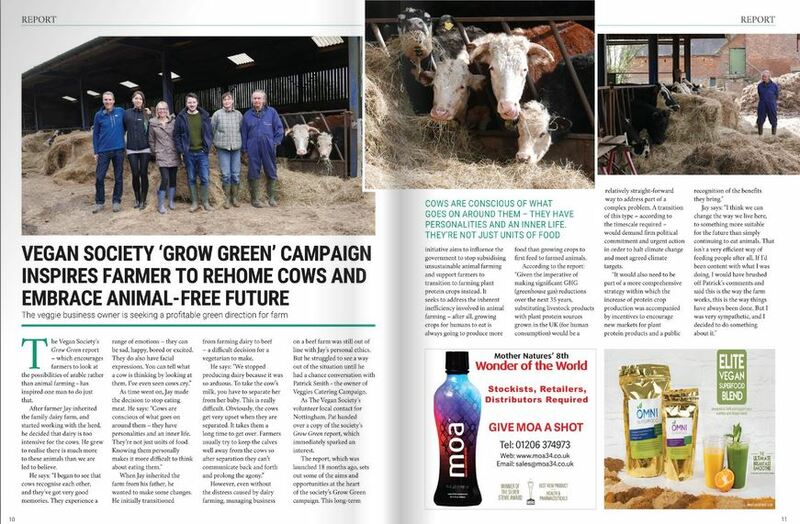 News that the Vegan Society is working with Bradley Nook Farm in Derbyshire to transition from beef to vegan organics is the icing on the (vegan) cake of all our years of campaigning. It shows the great value of networking both within the vegan movement and with movements beyond in the wider world. Veggies met up with farmer Jay when catering at Northern Green Gatherings at his inherited family farm. The farm near Ashbourne, Derbyshire is also one of a number of locations used on rotation for Earth First! Gatherings. As vegan campaign caterers Veggies has catered for EF! since the very first gathering in 1991, helping in a small way to maintain a vegan ethos in the grass roots eco-action movement. It was through the involvement of long term Veggies member Cathy in another Vegan Society project (hospital catering) that the opportunity​ came about to mention in conversation the potential to veganise Jay’s farm. The rest is, as they say, history, and hopefully a turning point in the transition of many more livestock farms to the compassionate and efficient farming of Food for a Future. Hosting camps & gatherings can provide a useful income stream for vegan landowners. We will actively encourage the gatherings at which we cater to consider holding events at Bradley Nook Farm. 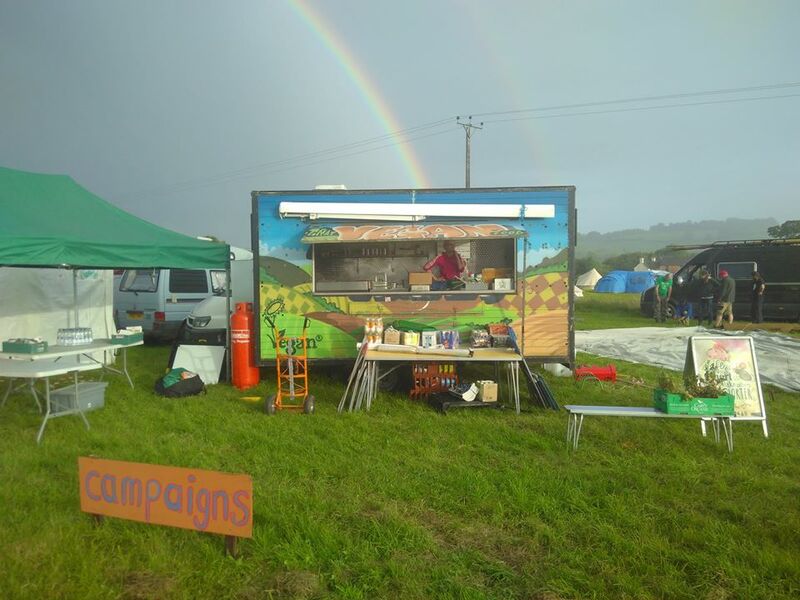 As participants in the Northern Green Gathering (NGG) held there each August, we will urge the organisers to encourage other caterers at the event to honour the compassionate stance of the farm by highlighting vegan options. We know this to be a popular position to take as Nottingham Green Festival has declared a fully vegan ethos from 2017. Meanwhile Jay has already discussed plans for his new ventures with Derbyshire Dales District Council. Visit freefromharm.org to read the inspiring stories of other former meat & dairy farmers that became vegan activists. A vegetarian farmer has given his herd of cows to an animal sanctuary to protect them from the slaughterhouse. 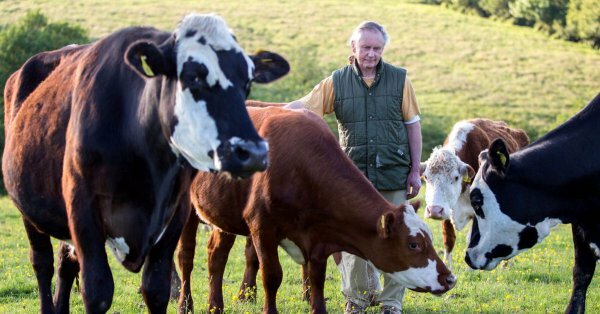 Jay Wilde, 59, who farms in Ashbourne, Derbyshire, sent 63 cattle to a Norfolk rescue centre as he could no longer bear to send them to be killed. 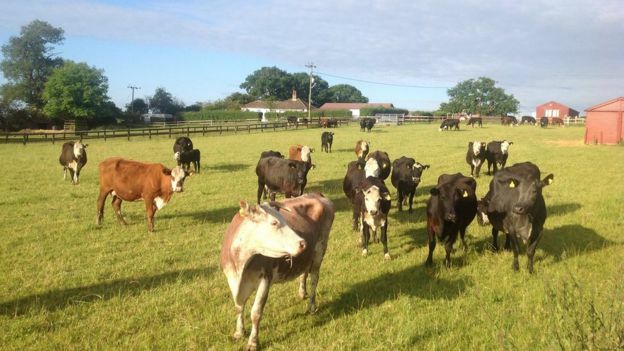 The Hillside Animal Sanctuary near Frettenham said 30 of the cows are pregnant and all the animals “would live out their lives essentially as pets”. 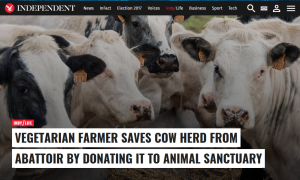 A herd of cows from the East Midlands will be mooing a sigh of relief thanks the kindness of their owner, vegetarian farmer Jay Wilde who has sent them to live out their days in an animal sanctuary. Leaving their old cattle sheds at Bradley Nook Farm in Ashbourne, Derbyshire, the 59 cows were rehomed in Norfolk at the Hillside Animal Sanctuary on Monday. “I’m relieved to have made the decision to no longer farm animals, something which I always found quite upsetting,” Mr Wilde said. 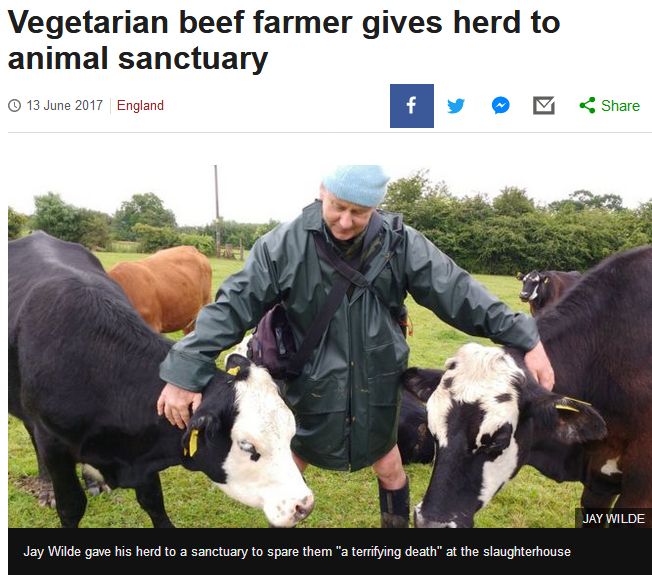 The founder of the sanctuary, Wendy Valentine, said Mr Wilde’s cattle could now enjoy their full 25-year lifespans rather than reaching the slaughter age of two to three years. The sanctuary was started in 1995 to draw attention to the effects of factory farming and needs to raise a minimum of £5m per year to continue to care for the animals. The donation was organised by the Vegan Society and Mr Wilde now plans to farm organic vegetables free of animal products and fertilisers to sell in the flourishing vegan market. Veganism is a lifestyle promoting peaceful living because it is interconnected with so many important ethical issues. 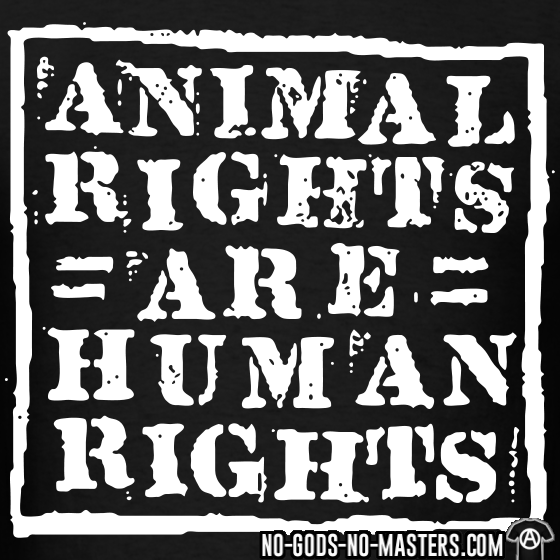 These span animal rights, human rights and environmentalism. In the words of a wonderful farmed animal sanctuary: ‘If we could lead happy and healthy lives without harming others, then why wouldn’t we? More than 70 billion farmed animals are reared annually worldwide. More than 6 million animals are killed for food every hour, in ways that would horrify any compassionate person. Other animals are sentient beings like us, with their own needs, desires and interests. We now know that like us, they can experience a wide range of sensations and emotions such as happiness, pain, pleasure, fear, hunger, sadness, boredom, frustration or contentment. They are aware of the world and what happens to them matters to them. Their lives have intrinsic value – they are not inferior beings nor just here as resources or tools for human use. Vegetarians and vegans will save anywhere from 100 – 400 animal lives each year. We are currently growing enough food to feed 10 billion people but worldwide more than 40% of grain is fed to livestock. 82% of starving children live in countries where food is fed to animals, and the animals are eaten by western countries. On a plant-based diet no one has to go hungry. Each day, a person who eats a vegan diet saves 1,100 gallons of water, 45 pounds of grain, 30 sq ft of forested land and 20 lbs CO2 equivalent. To produce one pound of animal protein vs. one pound of soy protein, it takes about 12 times as much land, 13 times as much fossil fuel and 15 times as much water. 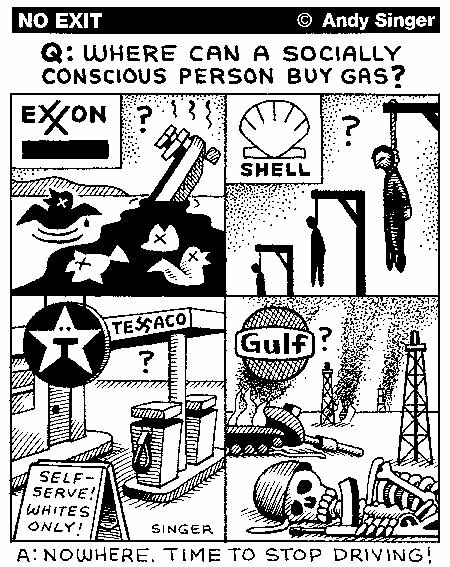 On February 15, 2003, there was a coordinated day of protests across the world in which ….. Demonstration. 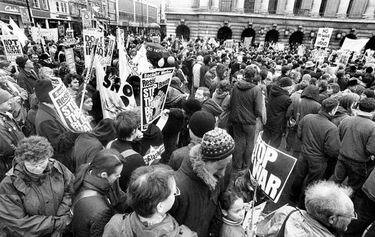 The British Stop the War Coalition (StWC) claimed the protest in London was the largest political demonstration in the city’s history. We’ve been civil; It’s time to get disobedient! See See http://uk.indymedia.org for independent info on actions in the uk. Join protests and direct actions to stop war. The conflict in Iraq has been presented in the media as a purely human catastrophe. Other animals have been largely ignored. There is no reason to remain silent in the face of the interlinked abuses of all animals – including humans. Until we get rid of cruelty – all cruelty – we will never end animal abuse. We need to stop being abusers, full stop – not just pick and choose our victims. If the world was vegan and we still waged wars we would not have won our cause. The risk we run is that our circle of cruelty rather than compassion will continue to spread and destroy the world that all creatures inhabit. Disclaimer: Please don’t do anything to stop the indiscriminate killing of men, women, children and animals unless it is specifically authorised by unanimous agreement of the international community. Farming animals for food wastes a lot of energy. Animals are food and energy factories in reverse – most of the nutritional and energy value of what they eat is used by their bodily functions. It takes about 10kg of prime vegetable protein to produce 1kg of meat protein. Oil-based fertilisers are needed to produce crops fed to intensively reared animals. By burning fossel fuel for unnecessary industrialisation world-wide, the human race is causing a change in climate which, if unchecked, will make life on this planet unsustainable. To get a picture of the scale of the oil trade in Nottingham, you should visit the Colwick Oil Depot photo /map here. Not satisfied with overconsumption of the world’s oil supplies, the affluent west exports its wasteful practices to hungry countries. Factory farming systems are being promoted in hot, dry areas, competing with people for limited water supplies. 200 – 250 gallons of water are required to produce a pound of rice, but between 2,500 to 6,000 gallons are used to produce a pound of meat. Future conflicts are predicted for control of water supplies, whilst inappropriate mega-dam projects benefit western construction companies, whilst displacing local peoples. 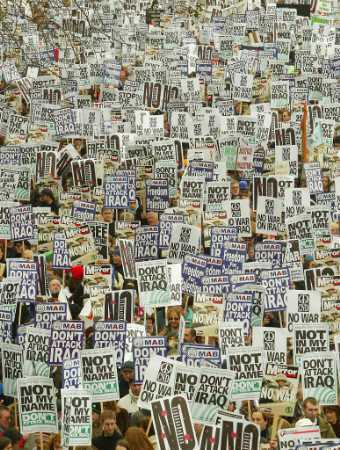 Help Blair get the message: “Send rice to the people of Iraq; do not attack them”. Send contributions of rice to Tony Blair, 10 Downing St, London SW1A 1AA. 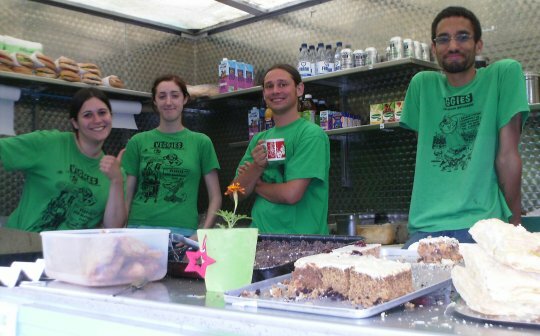 On 15th February 2013, Veggies Crew rose to the challenge of feeding 1000 of those travelling to London from Nottingham. Food was co-ordinated for 20 (out of 24) coaches departing from 4 different locations, including 3 from Hyson Green / Forest Fields, which left from the Sumac Centre. This was probably our biggest ant-war catering operation since the heady days of the 1980’s when we catered on Nottingham CND’s TRAIN to London. During that same period, we also catered in 6 inches of February snow at Molesworth and at the ‘Reclaim Chilwell’ direct action (events which were co-ordinated out of offices at the Rainbow Centre, the former home of Veggies). Demo report from Squall website (and much other stop the war news)..
An amazing feat of indy photo journalism has been put together by Nottingham based photogapher, Tash. To check out his galleries and slide shows from London, Feb 15th and Nottingham, March 8th [click here]. Saturday 8th March : Despite the wet & windy weather Veggies turn out as Nottingham Marches Against War in probably the biggest protest seen in Nottingham since the days of the Miners Strike. Chetwynd Barracks, at Chilwell, near Nottingham, is the national mobilisation centre for the TA & reservists. It is where they are being trained, equipped and receiving medical treatment and innoculations prior to being sent to the Gulf. This multimap view includes a photo of the base and a route planner, centred on the Toton Gate. You can zoom out to see more of the surrounding roads. There is another main gate on Chetwynd Road on the Chilwell side of the base. For future reference: Chetwynd buses: 33/33a/c run from Victoria Centre, via Angel Row & thru Beeston Station, which is adjacent to Beeston Square; 5b from Broadmarsh, via Friar Lane off Market Square, thru to Chilwell Depot Corner. Both services run roughly on the hour & every half hour during the day including saturday. Peaceful, Creative Direct Action Against Menwith Hill, the largest US spybase in the world; operating as US sovereign terrortory (sic) and playing a crucial role in the war on Iraq and a key element in the expansion of the ‘Star Wars’ project. “I met some of the Nottingham contingent to Menwith Hill after I got back from London, and heard of a good turn out numbering more than 1000. There was some fence damage and digging under. Police response was fairly hands-off but there was still 6 arrests, according to those present, including one from Nottingham.” (nb after staying over in Manchester, he arrived back the next day). For more info see www.now-peace.org.uk and Yorkshire CND . Photo of the base and a route planner. About 400 people came from all over the country – north, south, east and west to the Gatecrasher’s Ball at the American base at Menwith Hill calling for Independence FROM America. It was a very good day. The weather was kind – blue skies and sunshine. People rose to the occasion and came dressed in wonderful costumes including beautiful, imaginative ball gowns and masks (some men included!) and top hats and tails. There was a wonderful line up of artists – musicians and poets which was hosted by Mark Thomas who also spoke in his unique way – a combination of humour and political satire. Food was provided by Veggies. Veggies Catering Campaign gives regular support for peaceful, creative direct action against Menwith Hill, nr Harrogate, the largest US spybase in the world; which played a crucial role in the war on Iraq. 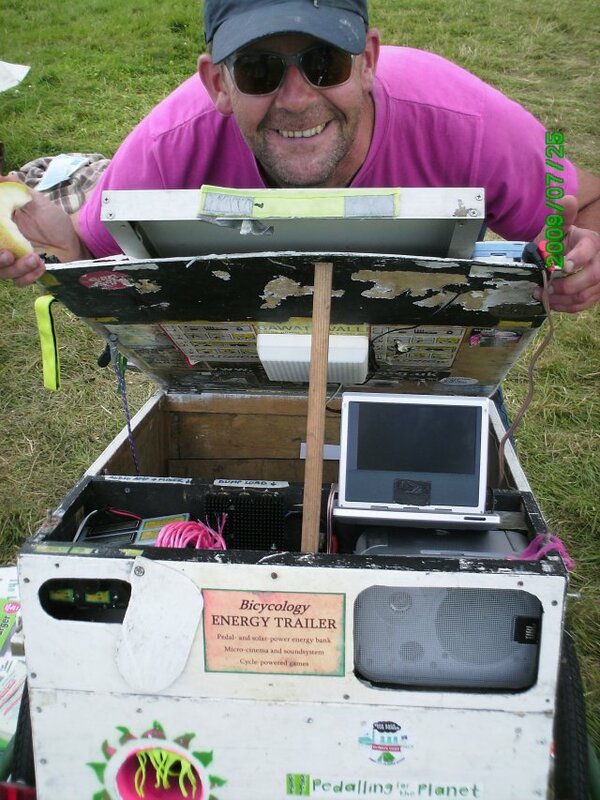 After the ‘Foil the Base’ event in March, ‘Independence from America’ on July 4th and ‘Don’t Take the Peace Out of Space’ in October, we look forward to travelling to the beautiful Yorkshire Moors again in 2004. To join us, contact Veggies at the Sumac Centre. A national weekend gathering is to be hosted by the Sumac Centre in March 2004, with Justice Not Vengeance and ARROW (Active Resistance to the Roots of War), for activists to discuss, debate, and share skills, experiences and ideas. Through this new and simple initiative, Veggies Catering Campaign raises regular funding for local campaigns for global justice, including donations to Nottingham Friends of the Iraqi People. RAF Cottesmore is a key component of Joint Force Harrier, and is currently home to three squadrons of Harrier GR7 aircraft. A significant element of the Harrier force is now in the Gulf. RAF Cottesmore is less than 40 miles from Nottingham, in nearby Rutland. For those interested in visiting here is a map and aerial photo of the village and base. Animals are the forgotten victims of war. They are never reported or even mentioned in the casualty figures, despite the fact that the numbers killed must far outweigh the human dead. War is not only an assault on people, it is an assault on the whole of nature, on the fragile ecosystems that all living beings require for their survival. Moreover, even before wars are fought, animals are the victims of weapons’ research. In places like the top-secret Ministry of Defence laboratory in Wiltshire, Porton Down, animals are routinely used in experiments to develop more lethal and efficient weapons of mass destruction. And in the event of a US-led attack on Iraq the US army plans to ride chickens into battle in cages atop Humvees, used as early warning gas detectors – but the plan has been put on hold after 41 of the 43 chickens deployed to the Gulf died within a week of arrival. Still, headed into the fray will be some of the 1,400 dogs who work in the US military – carrying out tasks ranging from mine detection to the rescue and recovery of dead and wounded personnel. The U.S. army unveils its most unlikely mine detector – the Atlantic Bottle-Nosed Dolphin. At the southern Iraqi port of Umm Qasr, secured by U.S and British forces after days of fighting, soldiers made preparations for the arrival of a team of specially trained dolphins, to help divers ensure the coastline is free of danger, before humanitarian aid shipments can dock. U.S. Navy Captain Mike Tillotson told reporters that three or four dolphins would work from Umm Qasr, using their natural sonar abilities to seek out mines or other explosive devices which Iraqi forces may have planted on the seabed … (Reuters) – More on this topic. Animal victims of war are invisible. Our culture conspires to make them so. Animals understand none of it, play no part in any of it, but when they are crushed and mutilated – wilfully or otherwise – there are those who dare tell us to remain silent. We say: dare to speak out for the helpless animal victims and do so loudly and with confidence. Let those who have made an argument for this war, who have helped engineer it, see what war means for species other than our own. Although not a permanant solution for our fuel needs, bio-diesel is a much more sustainable system that can decrease reliance on fossil fuels. Veggies & Sumac Centre are founder members of Nottingham’s bio-diesel purchasing collective. Even the most optimistic commentator forecasts that oil supplies will be exhausted within 60 years. Some say, with a growth of 2% per annum, as soon as 40. So what are our children to use for transport? How is the so-called “sustainable society” to be achieved? Biodiesel is a sustainable transport fuel made from organic oils and fats, to be used alongside a policy of reduced vehicle usage. Because plants absorb carbon dioxide whilst growing, CO2 emissions are also substantially reduced. Minimum maintenance layout – we’re too busy in the real world to get lost in cyberspace. Please excuse any delay in updating the diary whilst we are busy with the events listed. We should not feed plants to animals for meat, cheese, milk &amp; eggs … we should use plants to actually make them! The Giuseppe program from Chile’s Not Company (NotCo) are replicating animal ingredients, but entirely based on plants. A group of Chilean scientists are on a mission to change the way that we make food and reduce the impact of animal faming on the environment in the process . The researchers have set up a company that uses artificial intelligence to find a way to replicate animal-based products like milk, yoghurt, cheese and mayonnaise, using plant based ingredients. Listen to this exciting report 18mins40″ in to this Science in Action program from BBC World Service and read more:meet-the-worlds-smartest-food-scientist-guiseppe. Talk to Al Jazeera – Beyond meat: The end of food as we know it? With the latest breakthroughs in artificial intelligence a whole new concept of food may soon radically change what we eat. And at the same time, some experts believe, it could reduce global warming. No longer based on animal ingredients, this is a food entirely based on plants – although it looks and tastes like the classic food based on ingredients derived from animals. This is not a new idea, it has been around for about 10 years. But the breakthrough has been delayed, perhaps one of the reasons is that many consumers still prefer locally produced food, they want to trust the supply chain, and not simply depend on big manufacturers. Commercial engineer Matias Muchnick and Harvard research associate Karim Pichara are two of the founders of the Not Company.Together with biochemist Isidora Silva they are developing new plant-based food and are determined to bring it to people in their local market. Livestock is also a major driver of deforestation, desertification, as well as the release of carbon from cultivated soils. Overall the livestock sector is contributing 2.7 billion tonnes of CO2 emission according to the UN. “When you get behind the scenes of the food industry, you don’t like what you see. There is a lot of things that we should be knowing… but we are blindsided by a whole industry that is making it really hard for us to see what we are really eating,” says Matias Muchnick. The main scientist of the Not Company team is a computer, an artificial intelligence algorithm programmed to become the smartest food scientist in the world. It’s a complicated process but it’s designed to understand human perception of taste and texture which allows it to suggest clever recipes for sustainable and tasty plant-based foods. And it even understands the availability and use of resources for every single plant in the company’s database. “We want people to eat better, but without even knowing, that’s the main objective of the Not Company,” Muchnick says. We are sad to bring you the news of Joan Court‘s death this month. She died very peacefully, her cats around her. She was ninety seven. It will be followed by a party to celebrate Joan’s life at Mill Road Baptist Church, 178 Mill Road, Cambridge, CB1 3LP Veggies will be providing food and drink but it is strictly non-alcoholic! All Joan’s friends are warmly invited. If you are able to come, please email JoanCourt74@gmail.com. Joan requested donations instead of flowers, to be shared equally between Animal Aid and Hunt Sabs.There will be collection boxes at the party. It would be lovely if you could bring something purple (e.g. a ribbon or a flower) to put on her coffin at the crematorium. We will have Memory Boards at the party, and we hope that you will post a memory or a thought about Joan. After the party we will put these together into a book to celebrate her life. I do hope you can come, and help us make this a true celebration of an amazing life. Joan was a tireless campaigner who has supported Veggies Catering on many occasions. Her book ‘In the Shadow of Mahatma Gandhi’ has been available from Veggies bookstall. A tribute to Joan Court, written by Andrew Tyler of Animal Aid, has appeared on the “other lives” section of the Guardian website & in print edition on 24 December. My friend Joan Court, the animal and human rights activist, who has died aged 97, was driven by a powerful impulse to expose and remedy injustice and cruelty. She was also, as she put it, a “born sensualist”, her tastes running to strong colours, perfumes and “exciting action”. This, and her desire to do good, underpinned her many adventures. Her start in life was hard: her father, Cecil Court, a solicitor, took his own life, and her mother, Muriel (nee Gibson), was an alcoholic. She had an older brother, Peter. Joan’s schooling ended when she was 12, after her father’s death. She and her mother moved from their London home to work in domestic service in Cornwall and then Cape Town, South Africa. Returning to London in 1936, she went on to qualify as a nurse and midwife at St Thomas’ hospital, and as a social worker in Bristol. She practised as a midwife and, funded initially by the Friends Service Council (FSC) and later as a World Health Organisation employee, worked in impoverished regions of India and Turkey, and the Appalachian mountains of North America. In the 1960s, she was appointed director of the NSPCC battered child research unit, and was influential in gaining acceptance of a then unfamiliar concept in the UK. In 1946, when she was working for the FSC, organising midwifery services in the slums of Calcutta (Kolkata), she met and got to know Mahatma Gandhi. Joan, a lifelong vegetarian, developed a profound respect for his commitment, compassion and determination to achieve change through non-violent means. She tried to emulate these goals, campaigning first for children and, for the last 38 years, for animals. In 1978, after seeing a poster describing the horrors of animal research, she took part in an Animal Aid anti-vivisection march in Cambridge. The next day she founded a new Cambridge group, which was soon involved in all animal-related issues, including live exports, hunting, shooting, whaling and the meat and dairy industries. places. She locked herself in a cage and chained herself to railings. In speeches and interviews she refused to apologise for radical direct action, although she was opposed to violence. Her most lasting triumph was, with Pat Griffin and Sue Hughes, as one of three Cambridge “granarchists” who initiated what became a national campaign of opposition to Cambridge University’s plans for a massive new research facility that would have specialised in invasive neurologicalexperiments on monkeys. The university abandoned the project in January 2004. 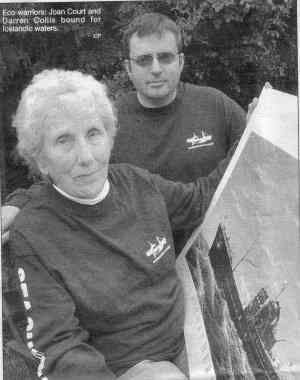 At the age of 85, she joined the Sea Shepherd flagship, Farley Mowat, on a hunt for illegal fishing vessels in the South Atlantic. Joan could be self-absorbed, cantankerous, bossy and infuriating, but her friends were friends for life.